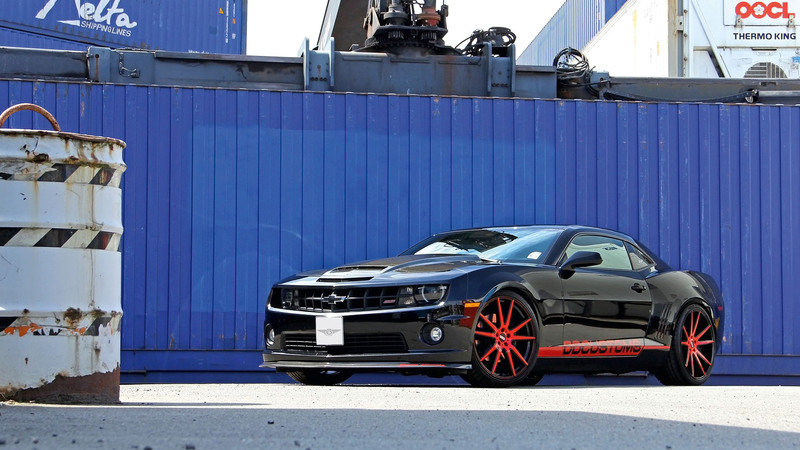 This gorgeous 2010 Chevrolet Camaro SS was tuned by the German tuning company called “DD Customs”. They’ve managed to increase this car’s power to up to 467 hp (343 kW) and torque of 449 lbs-ft (609 Nm). Before this, its stock engine produced 426 hp. The car now is on two-tone 22-inch Drewske STC-10 wheels wrapped in 265/30 (front) and 305/25 (rear) tires. The 4.5-link independent rear suspension and four-wheel disc brakes are one of the highlights of all the models of 2010 Chevrolet Camaro. As many as 10 different colours and sleek style models can make it tough for you to pin point the best. The exteriors and interiors follow the contemporary tastes and preferences, with safety features installed in these models, truly convince you to invest your trust on it. Body coloured air dams, rear and front bumpers and grilles – all components lay strong foundation to its smart exterior looks. The car features 18-20 inch of tires to allow a powerful grip on the road. Specific to SS and LT models, the car accommodates HID headlamps, featuring halo rings and tail lamps. Automatic headlights and fog lights also make it a hot choice. The interiors for 2010 Chevy Camaro feature a unique SS trim on instrument panel. Exclusive Sill plates also contribute towards elegant interiors of all these models from Chevrolet. Leather seats and leather-covered shift knob and steering wheel provide much deserving look to the car.